SOVEREIGN OF INDIA is a nation led by EMPEROR TOJO on the continent of Asia. SOVEREIGN OF INDIA's government is a Dictatorship with very liberal social policies. Economically, SOVEREIGN OF INDIA favors extremely left wing policies. The official currency of SOVEREIGN OF INDIA is the Rupee. At 127 days old, SOVEREIGN OF INDIA is a mature nation. 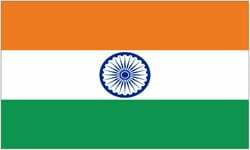 SOVEREIGN OF INDIA has a population of 320,216 and a land area of 2,000.00 sq. miles. This gives it a national average population density of 160.11. Pollution in the nation is a disaster. The citizens' faith in the government is completely depleted with an approval rating of 0%. 04/16 08:42 pm - SOVEREIGN OF INDIA had war declared by Bruh Land for the reason of "This, is, SPARTA!". 04/16 04:56 pm - SOVEREIGN OF INDIA had war declared by The Kingdom Of Serb Republic for the reason of "This, is, SPARTA!". 04/10 12:09 pm - SOVEREIGN OF INDIA had war declared by Federation of Hades for the reason of "YIPPEE KI YAY MOTHAFUCKA". 04/08 04:50 am - SOVEREIGN OF INDIA had war declared by Paragon for the reason of "You're a disease, and I'm the cure.". 04/03 01:09 pm - SOVEREIGN OF INDIA had war declared by OPPERS MUTHLAND for the reason of "Dead men taste like chicken.". 03/27 12:37 am - SOVEREIGN OF INDIA had war declared by South Khalistan for the reason of "Revenge for 1984 sikh genocide". 03/26 02:00 pm - SOVEREIGN OF INDIA had war declared by The Northern Isles for the reason of "Gib me all ur moneyz". 03/24 07:30 am - founded a new city, Imperial city. 03/12 03:05 am - Samuel Bates removed TOJO from the alliance The Foundation. 03/08 07:15 am - SOVEREIGN OF INDIA applied to join the alliance The Foundation. 02/24 05:32 am - SOVEREIGN OF INDIA had war declared by Volskurn for the reason of "Cuz you Indian Dhoti! No one likes you! INDIAN DHOTI! Nepal!". 02/10 02:38 am - SOVEREIGN OF INDIA had war declared by Soviet union USSR for the reason of "I need money sorry". 02/09 05:18 pm - SOVEREIGN OF INDIA had war declared by Turke for the reason of "earth is mine". 01/28 12:48 am - SOVEREIGN OF INDIA had war declared by Nocturna for the reason of "We don't like you".